The hearing coincided with the 2019 National Small Business Federal Contracting Summit, jointly hosted by the U.S. Women’s Chamber of Commerce and The American Small Business Chamber of Commerce. Mr. Gorgone discussed the challenges small businesses face in establishing retirement plans for their workforce and make recommendations to assist small businesses to offer retirement benefits. One recommendation in particular would allow employers to make matching contributions to an employee’s 401(k) account based on the employee’s payments for student loans. 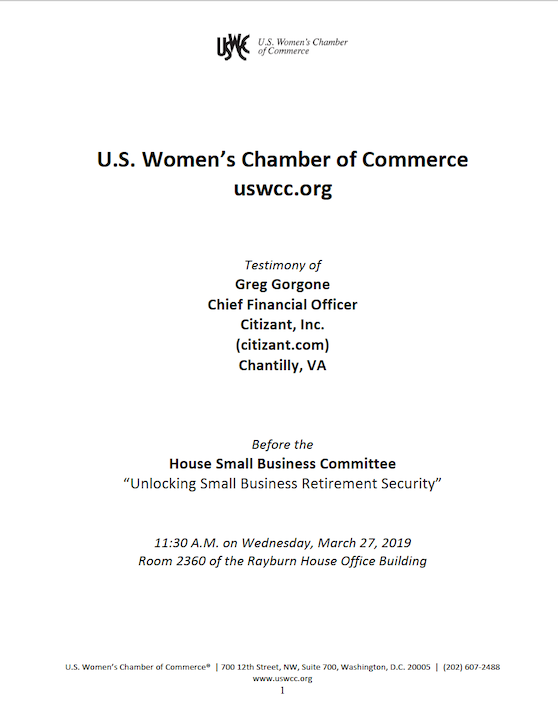 Citizant recommends this benefit and others proposed by the U.S. Women’s Chamber of Commerce be provided under law so all small businesses can help their employees save more effectively for retirement. Mr. Gorgone’s full testimony is available as a PDF to download.